About a month ago I purchased Bob Puff's entire remaining stock of multiplexer boards. This device brings the power and flexibility of larger systems to your 8-bit. The Multiplexer is a collection of cartridge interface boards that allow up to 8 ATARIs to read and write to the same drives (typically a hard disk), access the same printer(s), and talk to each other. It is the first practical networking system for the Atari 8-bit computer. One "master" computer (any 8-bit ATARI) is equipped with the master multiplexer interface. Then up to 8 "slave" computers hook up to this master, each having their own slave interface. The slave interface consists of a cartridge that plugs into the cartridge port. It has its own socket on the top so you can use whatever cartridges you desire with the system. "Common" peripherals (things that are to be shared) are connected to the master. On each slave, all disk and printer I/O is routed through the master so that no extra disk drives are needed. The master computer can be configured in any manner you wish. You may have certain peripherals local to the slave or routed to a different number on the master. Note that serial ports (R: RS232 interfaces) are not multiplexed. All slaves are independent and do not need to have the same program running on them. It is also compatible with APE, MYDOS, and Some versions of SpartaDos, all versions of REAL.DOS, ATARIMAX (Steve Tucker) FLASH carts, OSS carts, and r-time 8. It will NOT function with any of the MY-IDE interfaces. Right NOW, in order to produce each board to the quality standards that I would want to use for myself, I have set the SINGLE BOARD price at $75.00US. If you wish to purchase 3 or more it is reduced to $65.00. On orders of 5 or more, I may be able to reduce the per-unit price even further. I will pay shipping on any order over $250.00. These are fully functional and tested MULTIPLEXERs with MUX OS ROM and MUX SOFTWARE included. 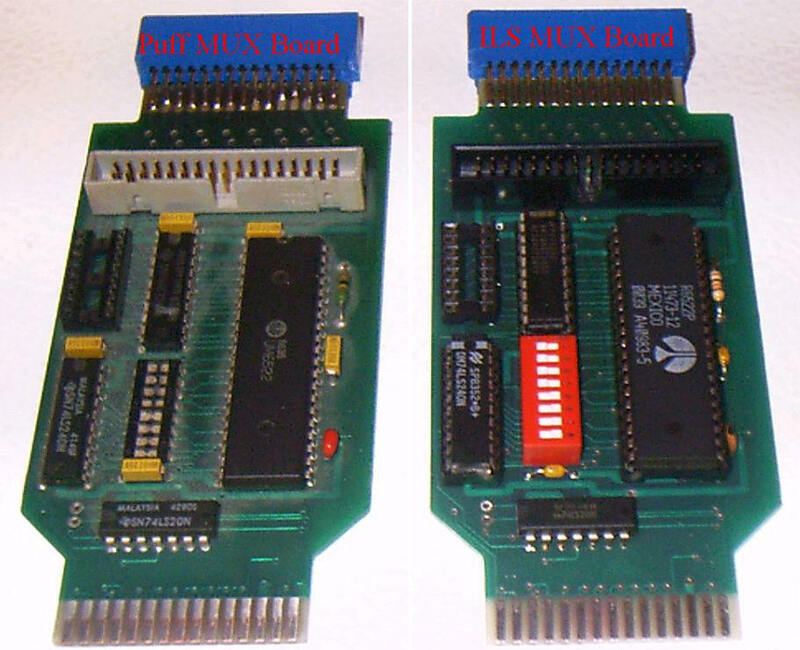 Production tests include mixing Original Bob Puff assembled/sold MULTIPLEXER cards with the newly assembled card in the same system, in every possible configuration. I want to make this clear: THESE ARE ORGINAL BOB PUFF PRODUCED MULTIPLEXER BOARDS with NEW parts. You will also notice from the graphic I used dip switches instead of punch pins, so that it is easy to add or change configuration of any part of your MULTIPLEXER system. 3M double-wipe contact chips sockets for all ICs. sealed, self-cleaning, self lubricating, gold contact DIP switches. port 8888, 8889, or 8890. I am sorry but my web site is not finished yet. Many pages are still under construction. In the future, I will be making available full support for the MULTIPLEXER, REALDOS, TCP/IP EXPRESS BBS SOFTWARE, and many other products on-line. If you have any questions, you can e-mail me at sjcarden@bellsouth.net or log into my bbs and leave feedback to sysop. Thanks for your interest in the MULTIPLEXER, and I look forward to providing the ATARI community with this and many other products for years to come.